The Queen of Sheba was the ruler of a city somewhere in Ethiopia or Yemen. According to sources, she appears as a beautiful Queen endowed with great wisdom as well as a magician. Some have called Makeda, other Balkis Yemen Baqama. According to later writings, she would be called Neghesta-Azeb, Queen of the South. The location of his real, far away, exotic kingdom has long remained an enigma. In the Bible, she is named Sheba and also Queen of the South. This sovereign had heard about the fame of King Solomon, son of King David. Wanting to judge by herself the wisdom of this king, she went to Jerusalem “By the road of gold and incense,” accompanied by many servants and loaded with presents, to be offered at King Salomon in gesture of gratitude for his invitation. Received with the highest honors in the newly designed palace of the king of Israel, Solomon gave her all the tribute due to a queen. She was deeply impressed by the relevant answers to her questions, which confirmed his reputation for wisdom and exceeded what the Queen had previously heard. She brought seven boys and seven girls all dressed and styled in the same way. Nothing could distinguish them. She asked King Solomon to separate males from females. The King brought a big Banaste for the children filled with dried fruits and sweets and he invited them to eat as much as they wanted. All the boys used their tunics and filled them up with candies while girls discreetly took whatever they needed. 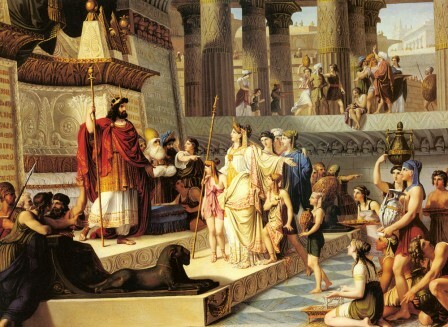 During her visit, she was seduced by the charm of King Solomon and returned pregnant to her country. She gave birth to a son named Menelik. The child later became King of Ethiopia, It is therefore that the country may claim an affiliation with the Jewish people. 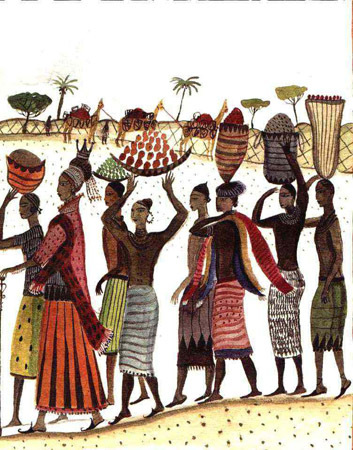 this version has remained in the Ethiopian cultural fund for centuries. This entry was posted in Bible, Ethiopie, Makéda, Ménelik, Reine de Saba, Reine du Midi, Roi Salomon, Route de l'or et de l'encens, Sagesse, Uncategorized and tagged africa, legend, queen on 21 December 2014 by Nicole Samuel Israel Guide.